Who says driving isn’t fun? BMW has continued to put the word “Fun” as well as “Performance” back into the mix. BMW Z4 coupe does just that. Continuing the line of Z series cars, which started with their fabled Z3 roadster and Z3 coupe, BMW has taken the word performance one step further with the new Z 4 Coupe. Sharp accented lines, as well as a tough modern muscular look, adds to the car’s mystique. This head-turning two-seat Coupe is definitely the vehicle for those who enjoy fast, and raw driving. With a look that will remind you of the old Jaguar E series, the BMW Coupe has a heap of flare gracing the Australian roads. Performance of the little BMW Z4 Coupe is as delightful as the car’s hot looks. BMWs have premium engineering that shows itself in the quality fit and finish, chassis dynamics and reliability. Performance is impressive. Three petrol engines are used to power the little sports Coupe. All respond nicely. The 2.5, 3.0 and M engines are a lot of fun to push hard. The quickest being the M engine which pumps out 252 kW of power. The car has a number of safety features. Active safety features include: Dynamic Stability Control, Brake Fade compensation, Start-off Assistance, Brake Drying, a Brake Stand-by feature and Dynamic Traction Control. What do these awesome features mean in a nutshell? The ability to have fun…safely. The BMW Z 4 Coupe also comes with run-flat tyres that have an automatic tyre pressure warning light that lets you know when one of your tyres is low in pressure. 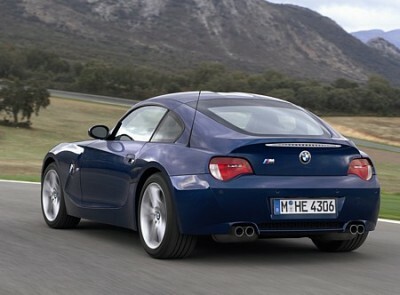 The Z4 also carries, like its predecessor the Z3, a body construction that is safety minded. The windshield struts are designed to cope with a rollover, airbags are standard and in the event of a nasty accident you can rest assured that the little BMW has premium safety technology throughout. The BMW Z4 Coupe also offers most of the little perks found in many luxury vehicles, like: headlight washers, heated windshield washer jets, side turn indicators, rain sensing windshield wipers and automatic headlight controls. For those who wish to have the wind blowing through their hair, there is a convertible model. In a nutshell, the BMW Z4 Coupe offers a style and image that few vehicles can match. BMW puts the excitement back into driving by making driving the way it should be … fun! For any more information on the BMW Z4 Coupe, or for that matter any other new car, contact one of our friendly consultants on 1300 303 181. If you’d like some fleet discount pricing (yes even for private buyers! ), we can submit vehicle quote requests out to our national network of BMW dealers and come back with pricing within 24 hours. Private Fleet – car buying made easy!